Serious about video strategy? Then it’s essential that you can manage and administer your videos in the most efficient way. Whether it’s adding, organising, categorising or retrieving videos - our Online Video Platform simplifies the process of video content management. 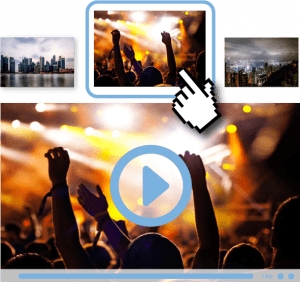 Drag and drop your video or select multiple videos to upload at once. Encoding is automatic, meaning that every video is converted into the most suitable format for the screen and device it is viewed on. Encoding takes place in the Cloud. This ensures that dozens of films can be converted simultaneously with quick turnaround time. Tag and categorise your videos. This will enable you to find and group them easily and will help when analysing of a specific group of videos. 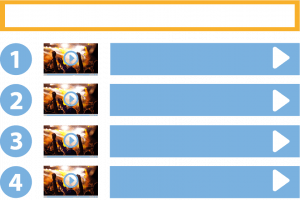 Create playlists to determine the playing order of videos. Build dynamic playlists to create an automatic playlist. Dynamic playlists contain videos that fulfil certain criteria. For example, playlists of the ten most recent videos, or a playlist with videos of similar subject matter. Displaying a thumbnail before the viewer starts a video is a good way to preview its content. Choose the thumbnail that you want to display in the player yourself. Select a still image from your video or upload an image of your own. Equipping your content with metadata makes the finding, interpreting, exchanging and managing of information easy. For example, assign a video a title, an author and copyright details. Configure whether these details are displayed on the start screen of the video. It's also possible to add descriptions, tags and deep links. Do you want metadata-related customisation, for example by providing multiple videos with metadata in bulk? If so, we’ve got the solution for you. 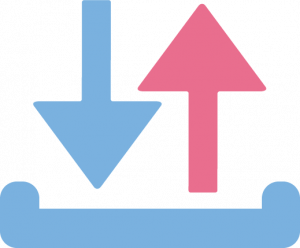 Your video or media file settings are ready to go, but you still need to make a quick adjustment? No problem! Simply replace the source file keeping all your settings intact. Want to manage all of your content simply and easily? Get in touch now to discuss the possibilities.